DL-44 Blaster - Made famous by Han Solo, the DL-44 is the blaster of choice for scoundrels across the universe. Ion Grenade - Inflict more damage on enemy vehicles with the Ion Grenade. Ion Torpedo - The Ion Torpedo locks on to and delivers extra damage to your opponents' vehicles. Ion Shock - Get electrified with the Ion Shock emote, available exclusively in the Deluxe Edition. Victory - Celebrate your win in style and pump your fist in the air with the exclusive Victory emote. Fight for the Rebellion or Empire in a wide variety of multiplayer matches for up to 40 players, or in exciting Missions available to play by yourself offline, split-screen with a friend of via online co-op. Star Wars Battlefront combines this epic action on a galactic scale with stunning visual recreations of some of the most iconic planets, weapons, characters, and vehicles in the Star Wars universe and the original sound effects from the films, to give Star Wars fans the ultimate, authentic and immersive interactive experience they’ve been looking for. Walker Assault – One of Star Wars Battlefront’s larger multiplayer modes, Walker Assault puts players in an epic 40-player battle between Rebels and Imperials. Fight as a Rebel to destroy the Empire’s onslaught of AT-AT’s by calling in Y-Wings. Side with the Empire to protect your Walkers while utilizing their mighty weaponry to crush the Rebel objective. 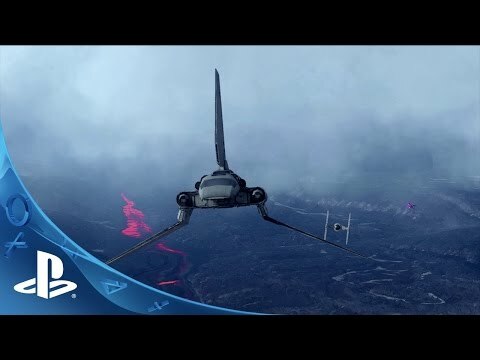 In addition to Walker Assault, Star Wars Battlefront will feature immersive, fun-filled multiplayer modes including Supremacy, Fighter Squadron, Blast, Drop Zone, Cargo, and more to be announced in the months ahead. Stay tuned for more information on these exciting multiplayer modes. Packed with action, depth and replayability, STAR WARS™ Battlefront™ Missions put you right into the action and let you experience the game by yourself offline, with a friend through online co-op, or via split-screen. Trials - Learn and master the skills needed on the Battlefront. Survival - Hold off waves of Imperial forces, from AT-STs, TIE Fighters, elite Stormtroopers and more. Experience a different Survival mission on every planet. Battles - Where you and a friend go head to head supported by a team of AI. Play as some of the most memorable characters in the STAR WARS™ universe including Luke Skywalker, Darth Vader and Boba Fett. Luke Skywalker - The Force is strong with this one. Live out your Jedi fantasies and deliver Force Pushes and Saber Rushes in the battles of Star Wars Battlefront. As Luke, move faster on the battlefield and use his lightsaber to deflect enemy blaster fire back at Imperial foes. Darth Vader - Ready to feel the power of the Dark Side? Strike fear into the hearts of any Rebel as the evil Sith Lord, Darth Vader. What he may lack in speed, he makes up with power and his unique abilities such as Force Choke and Saber Throw. Boba Fett - Go behind the mask of the mysterious and deadly bounty hunter Boba Fett. Use the jet pack to bring death from above, or take out Rebel scum with the powerful rocket barrage or flamethrower. These are just some of the Heroes and Villains you can expect to encounter in Star Wars Battlefront. We will be revealing more in the months ahead, as well as introducing a cast of memorableStar Wars characters you will interact with in Star WarsBattlefront.